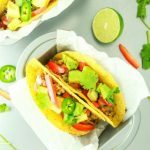 Spaghetti squash makes for a delicious taco filling! 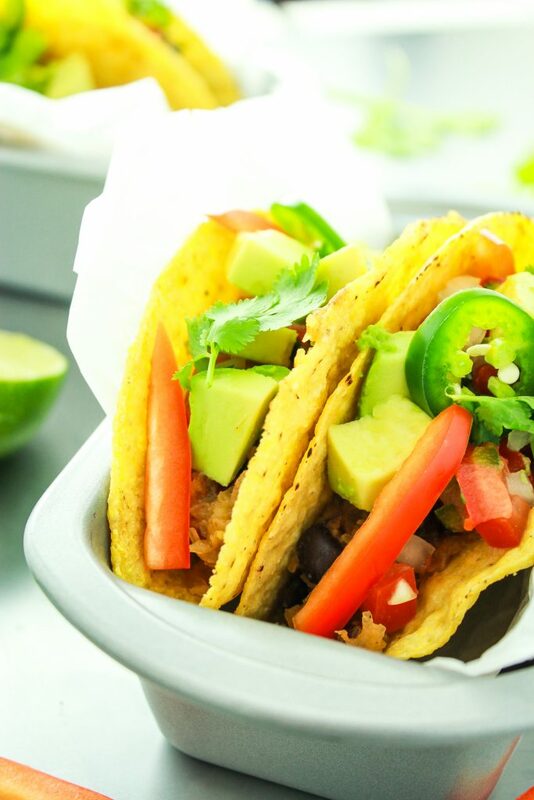 Flavor with taco seasonings and load up on your favorite toppings. I’m always looking for new ways to eat spaghetti squash. Of course, it’s delicious all by itself, straight out of the oven. Just a sprinkle of salt and pepper, maybe some fresh basil. But at the same time, it’s a blank canvas! Just think of the possibilities… It can be made into hash browns or lightened-up lasagna. It can be loaded to the brim with your favorite veggies. It can be shaped into nests and baked in a muffin tin with your filling of choice. It can even be tacos. 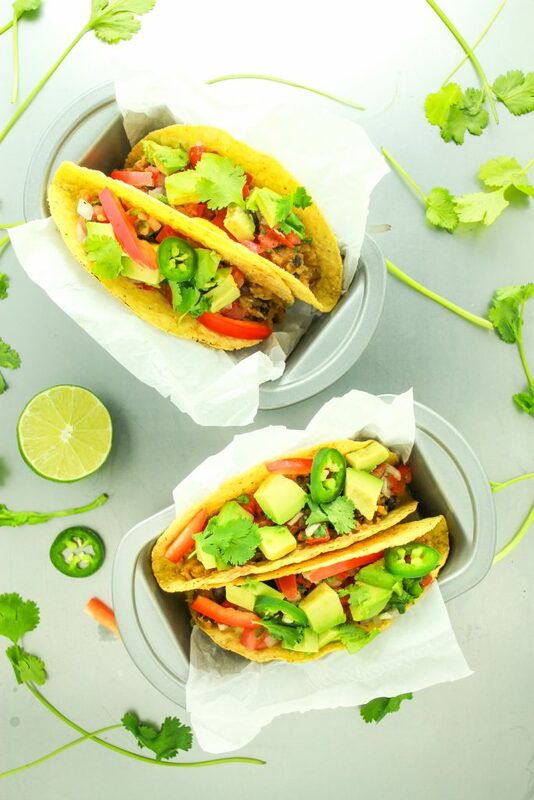 Really tasty, really easy, veggie tacos! You’re probably thinking – here’s this crazy lady with another weird recipe (i.e. dessert sweet potatoes.) But I swear, I haven’t lost it (yet.) 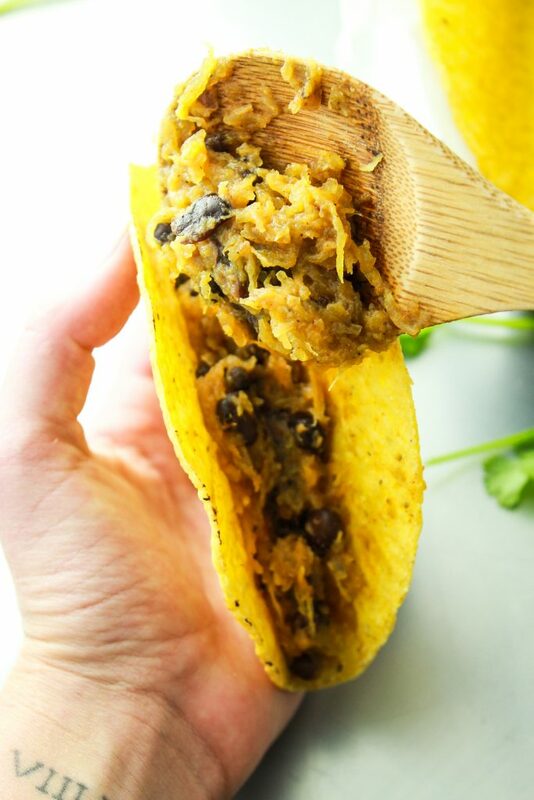 Spaghetti squash actually makes a bomb-dot-com taco filling when you doctor it up with taco seasonings (duh) and mix in some black beans. This recipe is incredibly easy and it makes for such a filling plant-based dinner. As for toppings, I recommend fresh red onion, chopped avocado, cilantro, and maybe some jalapeños if you’re feeling brave. I love this recipe because it’s a great way to load up on extra veggies! 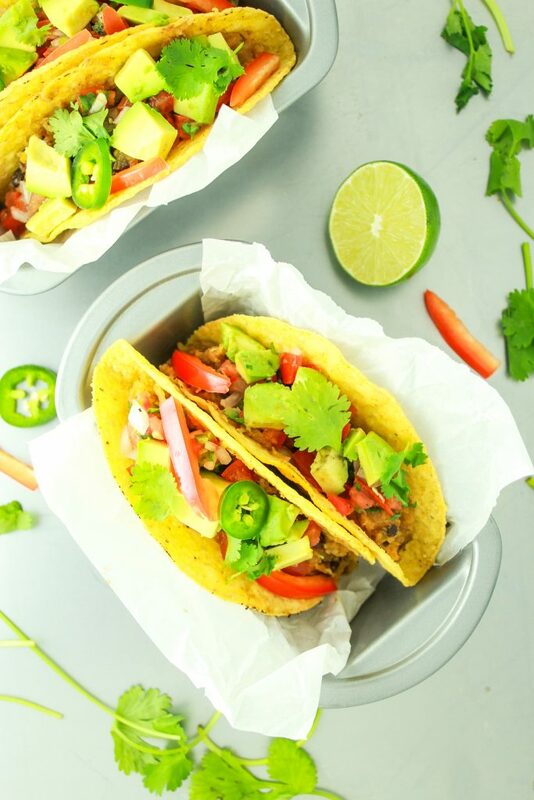 This spaghetti squash taco recipe is easy, filling, and delicious. 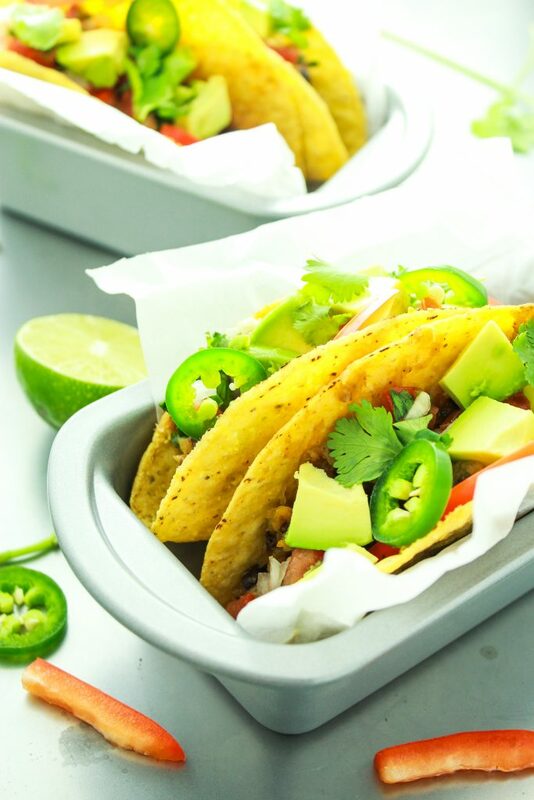 Flavor with taco seasonings and load up with your favorite toppings. Cut spaghetti squash in half lengthwise. Use a spoon to scrape out the seeds from each half. Preheat the oven to 400º and line a baking sheet with parchment paper. Drizzle olive oil over each half of the squash and sprinkle with salt and pepper (on the cut sides) and place cut side down on the baking sheet. Bake for 25 to 30 minutes. Set aside and allow to cool for 10 minutes. Use a fork to scrape out the spaghetti squash noodles – working gently will keep more of them in tact! Add spaghetti squash and beans to a large skillet. Add seasoning and stir to combine. Cook for 8-10 minutes, until the filling is hot. Scoop filling into hard or soft shell tortillas and add toppings. This made enough filling for 10-12 tacos. I assume most people would eat 1-2 hardshell tacos for dinner.